This report is segmented into modules, with each centering on a specific focal point of the research. Although it is helpful to explore the full report, each module is designed to be a stand-alone unit and can be read independently of the other modules without substantial loss of detail. 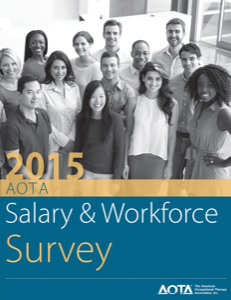 With more than 13,000 valid responses collected, the largest sample of any AOTA Salary and Workforce Survey, this report provides valuable information on workforce compensation trends to allow you to compare to your peers across the United States. The information in this report can also serve as a reference for further research on workforce issues and efforts to advocate for the distinct value of the profession.